Hammond introduces at Summer NAMM 2014 a new combo amp for keyboard, guitar and electronic instruments, the Leslie L-2215. French synth specialist Eowave is at Musikmesse where they showcase their Metallik Resonator along with new gear. Roland introduces the CUBE Lite Monitor, a 2.1 monitoring system for instruments that includes an iOS interface. 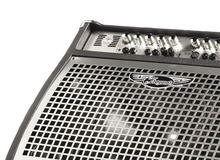 Gear4music.com have debuted two new keyboard amplifiers alongside their existing range of White Horse guitar amps - the KA-60 60W Keyboard Amp and KA-120 120W Keyboard Amp. The latest addition to Roland's KC-Series keyboard amplifier lineup, the KC-110 Stereo Keyboard Amplifier is now shipping. The latest addition to Roland's KC-Series keyboard amplifier lineup is the KC-110 Stereo Keyboard Amplifier. Roland announced the new KC-880 Stereo Keyboard Amplifier. The AXL 100W Keyboard Amp (AA-KB-120) has 100 watts RMS power, a 12" Alphatone speaker and four inputs with independent volume controls. The inputs include 1/4", XLR and RCA jacks.